The parish has a large number of footpaths and bridleways. 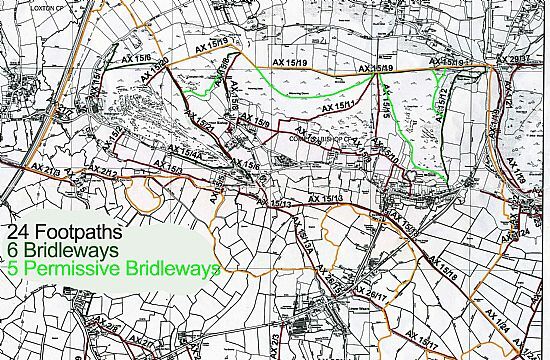 There are 25 public rights of way (PROW's), 6 bridleways and 5 permissive bridleways. The map below shows their location and reference numbers. Note that this map does not include the permissive bridleways, these will be added when these routes have been approved and numbered. Somerset County Council Public Rights of Way have developed their website to show all footpaths and details of gates, stiles, etc. It also has the facility for any problems to be reported directly to their PROW Officers. Have a look by clicking here.